26.2 Quest: What Is This Thing They Call Running? I have been taking a lot of time off these past few weeks trying to get this thigh back to where it should be. I am going to keep this post upbeat because I have already had the depressing one earlier in the week, and I don't want to go there again. I know what I am going to have to do to get this thigh back to normal but I don't want to do it. 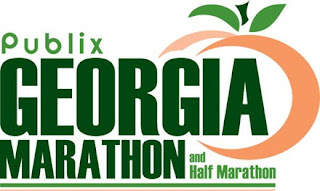 I am babying it along and it is not getting any worse so I think that is the option I am going to take till after the Publix Georgia Marathon in just three weeks. I would normally be talking about getting ready to taper at this point, but I have been tapering for the past couple months so I am going to train right through it. I am not doing any speed work or anything else that would remotely be considered a workout and I plan to continue that until 26.2 day. My longest run for this marathon training will end up being last weeks 16.5 mile run and I am OK with that. At times I feel like I should be running more, but then I remind myself I want to be running after the marathon and would prefer not to have to take a month or two off for a pulled muscle. For that reason I am OK with continuing my 3ish days off a week to keep this injury at bay. I have been running my long run on Sunday and feeling good. My thigh doesn't hurt during the run and feels fine following it as well. I start to feel it the next morning so I have been opting to take Mondays off. I have also been taking many Tuesdays off as well because that is what it has seemed to take to get it back to where it was before the long run. I then have been running Wednesday, either Thursday or Friday, then Saturday leading into my next long run on Sunday. I have been averaging the high 20's for weekly mileage. I know this is not marathon training, but it is what I can do right now to avoid furthering this injury. I will be running this marathon, but not racing it. I am going to go, run, and enjoy this 26.2, the event at the end of one of the most challenging marathon trainings that I have had, strictly from a mental standpoint. Ryders Eyewear - ends today! Have you ever undertrained for a marathon? What was the least weekly mileage you have ever run leading up to a marathon? The shortest long run? I hope for a quick recovery. It sounds like you will make the best of it. You're doing the right thing. Running after the marathon is a great way of looking at it. Take care and enjoy the runup to the marathon. Thanks everyone for the words of encouragement! I hope this rest gives you the much needed recovery.